The building to the right of the insurance company in your third photo -- the one with the curving driveway off the corner in the aerial shot -- is that "Four Acres"? It looks neat even from the air. Was the Home Security Life Insurance Company building outfitted for use by the DPD, or did they build a new one? From the looks of it I'm guessing it's new. Same building, just outfitted for use by the police department - but really unchanged on the exterior. For some reason, I'd thought the Home Security/DPD building had been low-income housing before it was the police station. However, I didn't drive back then, so maybe I just didn't go by it enough to understand what it was. Or was there an intermediate state? It's quite possible - I don't know. It is still the insurance company in Joel Kostyu's book, published in 1978. I first came to Durham in 1988, but my experience was pretty limited - I left in 93 and came back again in 1997. That's the first point at which I can say with certainty that it was the police department. The police department was located in the non-descript building next to city hall (the beige-ish one that turns its back on East Chapel Hill St.) from 1965 until at least 1978. If anyone knows when it moved to the Home Security building, let me know. I don't know if you caught it, but DPD is angling for a new headquarters some time in the near future. It'd be awfully nice if we could force them to make it an attractive and design-appropriate building. As for the City Hall Annex, it's neck-and-neck for the lead of the Downtown Durham Building I Hate Most with the SouthBank building. It's not quite as ugly, and doesn't dominate the landscape as much as SouthBank, but it's the biggest obstacle to something that's been a pipe dream of mine for a long time -- reuniting Holloway and Chapel Hill St. as a two-way, through street. If combined with NC 98, Duke Universiy (a street that badly needs renaming), Cameron Blvd., and NC 751, it forms the closest thing Durham will ever see to a reasonably straight, east-west throughway that passes through downtown. But for that to make sense, Chapel Hill and Holloway really need to connect at Mangum, and the Annex sits right in the way of that. My preference would be that they bulldozed the Annex, realigned Holloway to go straight from its intersection with Roxboro to the front of the post office, and then built an addition on to the main City Hall building that created a new "front" to city hall, facing Chapel Hill/Holloway and Rotary Plaza. In my mind, because of the shape of the block that would create, it would be something like the hemispheric colonnades that are all over the Watts Hospital/NCSSM buildings. Ah, well. Dreamin' at work again. I, too, have roadway fantasies about the mess on the east side of downtown. Mine usually involves reclaiming East Chapel Hill St. all the way to Cleveland (as it once was) and tearing down the city hall annex to build something that actually continues the CH St. streetscape. What happens to 'City Hall Plaza' (the original path of Holloway) in your idea, and how does Morgan connect? Heh. It's a tricky mess, but I've toyed with turning Rotary Park into a bastardized rotary, which the Mangum/Chapel Hill intersection makes awkward, then dumping Morgan into that. I've just wasted a lot of today messing around with my "inside-out surface parking" idea, and should have a fairly long post up on my blog sometime tonight. The case study there is the parking lot across Parrish from the new courthouse, and I fiddle with the streetscape there. After doing that, hopefully I'll get inspired and do the whole east loop. Actually, I don't find the SouthBank building all that horrible. I admit, it's not much from the outside, but on the inside it is pure vintage '60s, mostly unchanged it seems. What a wonderful throwback to my youth and all the promise of fancy new buildings. You should check it out before Greenfire/Maverick/Spitfire/Moderick (or whoever recently bought it) turns it into some hipster paradise (or just lets it rot). As for the DPD HQ, have the city cry eminent domain on Ronnie Sturdivant's dump next door (home of nubian art, old school buses, razor wire, thrift store stuff, washers and fridges on the sidewalk, and Jesus wants you to be rich propaganda), raze it and have those funky Freeloner put in some glass and steel eyesore...or something, anything. 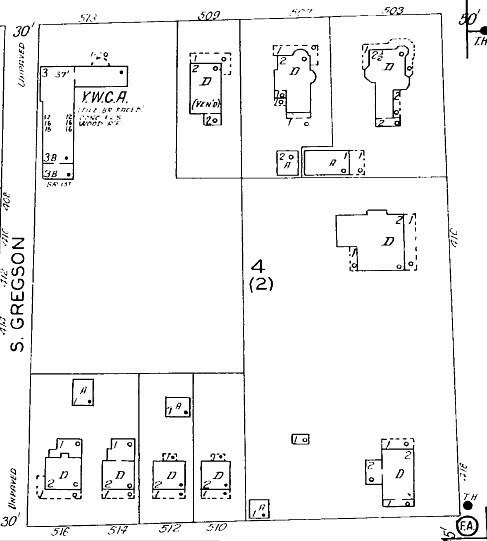 I worked at the Y for a short time in the fall of 1973, so I know the big building at Chapel Hill and Gregson was still standing at that time. Looking south/southeast from the north side of W. Chapel Hill St. 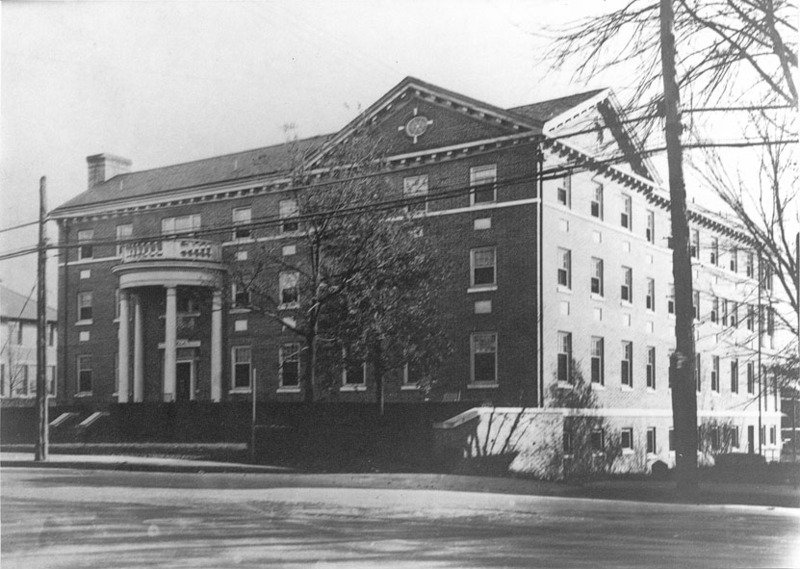 The Durham chapter of the YWCA was established in 1920 at 303 1/2 West Main St. (the Sparger Building,) upstairs from the Charles Department Store. Mrs. IF Hill was at the forefront of the drive to establish the organization, starting with a group of women and $100 associated with a "Council of Defense" during the First World War. The initial organization was affiliated with the nearest branch, in Richmond, VA. The national organization set an initial fundraising goal of $20,000; the local organization raised $24,000 in four days. Classes were established, and meals were served twice a day. The group focused on substandard housing and living conditions in the community as their initial community outreach. Interestingly, the constitution specified that the organization needed to have a Board of Trustees consisting of 5 men and 2 women. I suppose that quick $24,000 came with strings attached. The centennial edition of the Herald gives partial credit to the organization for the formation of the Harriet Tubman YWCA on Fayetteville St., formed in 1922. Open land at the southeast corner of South Gregson and West Chapel Hill Sts. was donated by John Sprunt Hill; ground was broken for the new Georgian style building in September 1926. Another view, below, from the late 1940s or early 1950s. In looking at the roofline, it appears there may have been a wing added to the east side. Two of the large houses to the east of this house (pre-1913) were torn down in the early 1950s for a gas station. "Again in 1950-51, to meet the needs of its advancing program, the YWCA conducted a building campaign for $275,000, headed by Marvin Fowler and Eugene Carlton and work began on a new building for the Branch Y and a new wing for the Central Association in July of 1952. These buildings will reach completion in a few months and will afford the association more opportunities to answer ever-present needs...."
The article later refers to the Central Branch - but never defines the Central Association, the Central Branch, or the Branch Y. So I'm not sure if there was a new YWCA built in 1952-3, or an addition added to the West Chapel Hill St. building, or both. 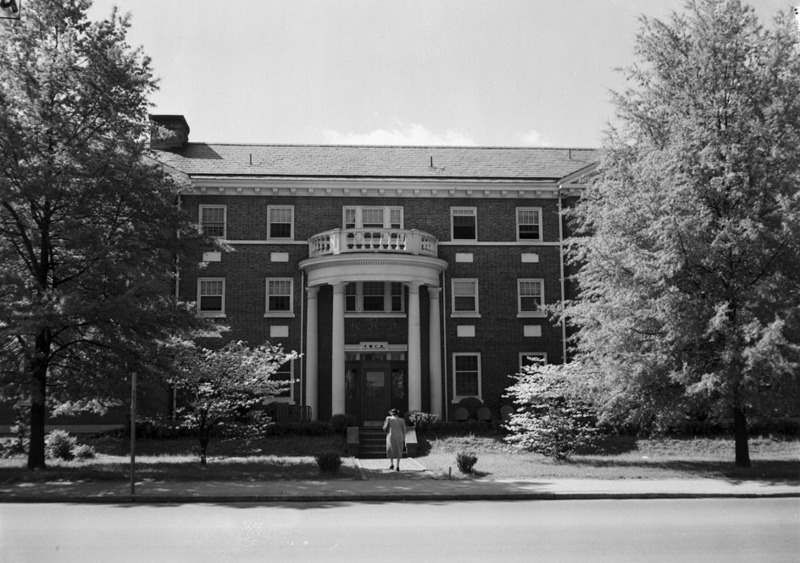 It does appear that, by the late 1950s, an addition had been built on the south side of the building at West Chapel Hill St. 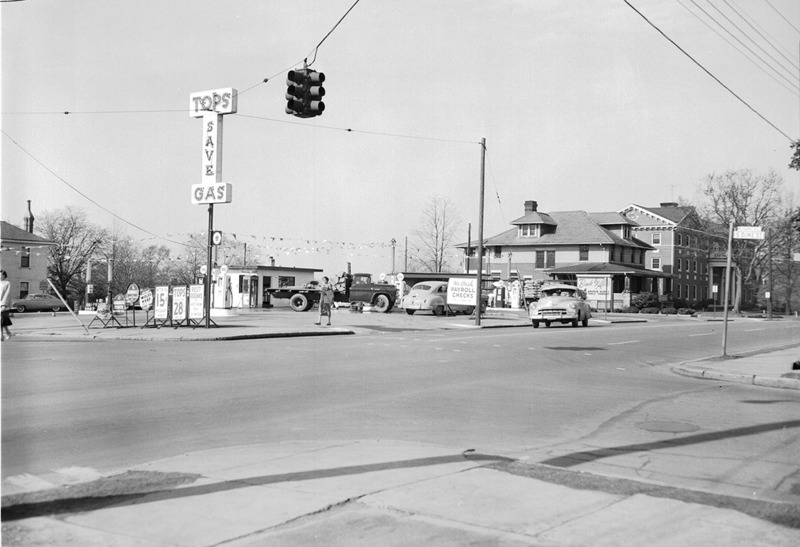 Looking southwest from South Duke and West Chapel Hill, April 1956 - the Y can be seen down the block. This service station was replaced with the Home Security Life Insurance Company building (current police department) in 1957.. 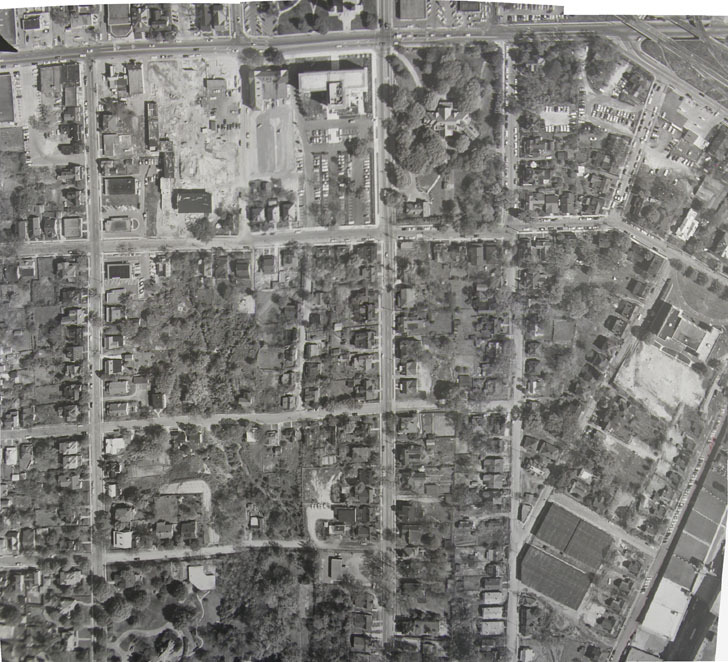 It and the YWCA co-existed for some period of time, as can be seen on this aerial view from 1959. (You can see the L-shaped building just to the left of the sizeable insurance building). It was still there after the Freeway had been gouged through just to the west. It's now (2006) a parking lot. I don't know when the YWCA was torn down, but it appears to have been around 1970. I do know that the trees that were once in front of the building were still here until about 5 years ago (and huge at that point), when the police department decided to cut them down. I guess because this corner wasn't ugly enough. The irregular grass in front was to accommodate these trees. The small walkway to the front entrance of the Y is still there, but that's about it.